Join us live from ESA’s technical heart in the Netherlands on 7 February for the celebration of the 10th anniversary of the Columbus laboratory and the launch of the first Automated Transfer Vehicle. One space lab, five spacecraft, 10 years of success. Nearly a decade ago, the Columbus laboratory set sail for humanity’s new world of space. Shortly afterwards, the first Automated Transfer Vehicle (ATV) arrived at the International Space Station as the most reliable and complex spacecraft ever built in Europe. This event is a unique opportunity to re-live exciting milestones and will feature a connection to the International Space Station as well as a look into space exploration plans. Tune in to celebrate the past, present and future of Europe’s major contributions to the Station with the larger Columbus family of planners, builders, scientists, support teams and astronauts. Careering around Earth every 90 minutes, 400 km above our heads, is the International Space Station – humanity’s orbital outpost. The first permanent European research facility in space, the Columbus module – seen partially in the bottom right of this image – was delivered 10 years ago this week. It has been home to a multitude of microgravity experiments covering fluid physics, materials science and life sciences, many of which are relevant to broader topics in space science. 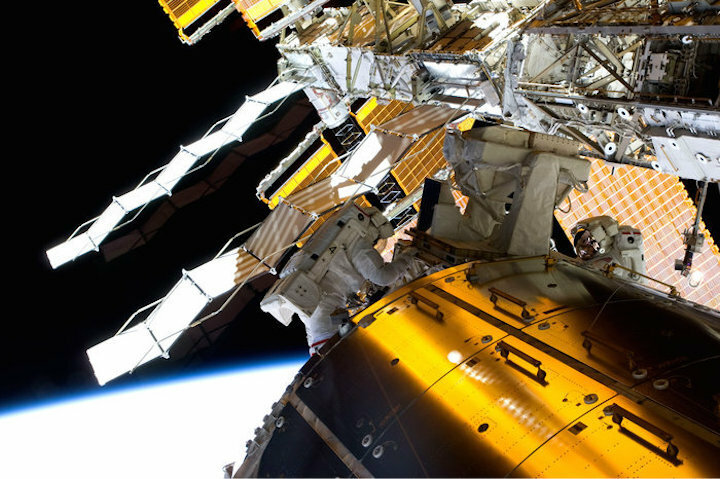 During the 2009 spacewalk pictured here, NASA astronauts John Olivas and Nicole Stott retrieved the European Technology Exposure Facility, which was attached outside Columbus, for return to Earth for analysis. The facility, and the subsequent suites of ‘Expose’ experiments, hosted experiments requiring exposure to the space environment, such as the harsh vacuum of space, ultraviolet radiation from the Sun, and extreme freeze–thaw temperature cycles. The experiments held a variety of organisms exposed to such conditions for long periods, to test the limits of life. Bacteria, seeds, lichens and algae, as well as small organisms called tardigrades or ‘water bears’, have spent months enduring these conditions and returned to Earth alive and well, proving that life that can survive spaceflight. Exobiology studies like this are particularly important for understanding if life could survive a journey through space between planets, or, for example, have endured the harsh conditions elsewhere in the Solar System. To that end, Expose had special compartments to recreate the martian atmosphere by filtering some sunlight and retaining some pressure, to investigate to what extent terrestrial life can cope with the extreme conditions on the Red Planet. Exobiology is also at the heart of the ExoMars programme, which will launch a rover to Mars in 2020 to probe beneath the surface, to search for any signs that life may have existed on our neighbour planet. The Solar Monitoring Observatory SOLAR, which studied the Sun with unprecedented accuracy across most of its spectral range, was also installed externally on Columbus. The instrument has contributed to solar and stellar physics and increased our knowledge of how the Sun interacts with Earth’s atmosphere, an important aspect in understanding what makes a planet habitable. In the future, the Atmosphere–Space Interactions Monitor, ASIM, will be installed outside Columbus to monitor electric events at high altitudes. These include red sprites, blue jets and elves that are thought to be triggered by electrical discharges in the upper atmosphere. These powerful electrical charges can reach high above the stratosphere and have implications for how our atmosphere protects us from radiation from space. A fascinating new experiment that will expand the range of research on Columbus is also coming soon with the addition of the Atomic Clock Ensemble in Space, ACES. Accurate to a second in 300 million years, it will enable the most precise measurement of time and frequency in space yet, essential to probe fundamental theories proposed by Albert Einstein with a precision that is impossible in laboratories on Earth.